A few of them were claimed to have gotten by with extremely little sleep. For example: Tesla, 2 hours of sleep per day. Is it true that some people can function normally on just 2 hours sleep per day, over the long term? A short-sleep human phenotype has been described in the literature. However, the reported sleep times I found in the scientific literature for those people are around 6h / day vs. 8h for controls, so nowhere near 2 h.
About Tesla: The Wiki page has a paragraph on his sleeping habits where biographies are cited that he claimed to never sleep more than 2h - but also that he spoke of dozing to "recharge his batteries". (Unfortunately, I don't have access to these books). However, see also below. People who experience microsleeps often remain unaware of them, instead believing themselves to have been awake the whole time, or to have temporarily lost focus. --- Wiki page on microsleep. It is well established that sustained wakefulness and the resulting cumulative sleep debt increase the likelihood that personnel will briefly (and uncontrollably) nod off on the job, even during flights (Dinges, 1995). The longer someone remains awake, the more likely these involuntary sleep lapses become. In addition, sleepiness takes a heavy toll on reaction time, motivation, attention, memory, endurance, and judgment (Krueger, 1989). 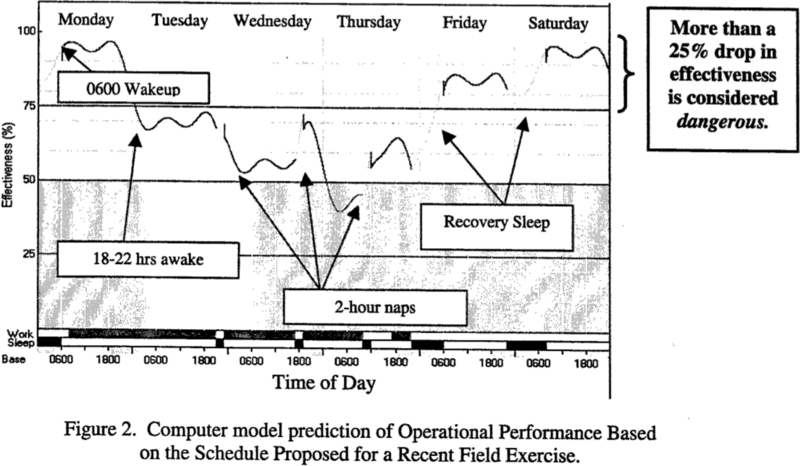 Naitoh and Kelly (1993) warn that sleep deprivation in extended operations quickly leads to motivational decrements, impairedattention, short-term memory loss, carelessness, reduced physical endurance, degraded verbal communication skills, and impaired judgment. ---Caldwell: "An Overview of the Utility of Stimulants as a Fatigue Countermeasure for Aviators"
It is well known that the amount of sleep needed varies between individuals. The habitual self-reported total sleep time per 24-hour day was much shorter in mutation carriers (average 6.25 hours) compared with the noncarriers (average 8.06 hours) in this family. The study looks at a number of mutations that seem to affect sleep duration as well as the need for sleep. So there are people who just need much less sleep than others. However, again the measured daily amount of sleep for the shortest sleeper group is 6 h, so nowhere near the 2h claims of the poster. However, the study also looked at the effect of chronic sleep deprivation at a level of 4h sleep per day over 5 days. Under these circumstances, the natural short sleepers did better in the vigilance tests (however, the paper also says that the particular test results are anyways known to be heritable to a large degree - and if I understand their table correctly, in all groups the sleep deprived "lapses" are roughly twice as much as the baseline performance. But the short sleepers had far less of them in absolute numbers). Remember, proper sleep is the only sure way to keep fatigue in check! If a full 8-hours of sleep is impossible, naps are a good compromise, each individual nap should be long enough to provide at least 45 continuous minutes of sleep, although longer naps (2 houre) are better. In general, the shorter each individual nap is, the more frequent the naps should be (the objective remains to acquire a daily total of 8 hours of sleep). (Emphasis original) It should be noted that the report also says "In particular, being physically fit apparently offers no benefit for sustaining mental alertness." Thus unfortunately there is no indication here that the military even considers selecting their soldiers according to their ability to function without sleep. Researchers have tried to determine the minimum amount of sleep required to maintain performance. According to many sleep researchers the minimum during each 24-hour period (“day”) is between 4.5 and 5.5 hours of continuous sleep. If you usually sleep between 7 to 8 hours per night, you may function adequately for a few days with this minimal amount of sleep. However this cannot be sustained for an extended period of time. If you get less than your required sleep for three or more consecutive days, you may perform as poorly as though you were legally drunk. Such tasks as driving, piloting, or operating dangerous equipment require that you be alert. Under extreme circumstances where sleep cannot be achieved continuously, research on napping shows that 10- to 20-minute naps at regular intervals during the day can help relieve some of the sleep deprivation and thus maintain minimum levels of performance for several days. However, researchers caution that levels of performance achieved using ultrashort sleep (short naps) to temporarily replace normal sleep, are always well below that achieved when fully rested. It is, however, better than having no sleep! Unfortunately, like in the related question Did Albert Einstein sleep 10-11 hours daily?, I found tons of varying claims - but no reliable sources. However, the short sleeper claims do vary quite a bit even for the same famous person: taking Tesla as an example as he was topic of the original question, the 2h number appears often. However, the poster in the question omits the dozing, and this web page says "After a short stint under Edison's umbrella, Nikola Tesla became a bitter rival of his former mentor. We have all heard of the "war of the currents", but Edison and Tesla clashed in another battlefield. They tried to outbid each other in sleeping little. Tesla noted that Edison slept much more than he would want others to believe. That injects a dose of boastful personality to their own reports on how much the great inventors slept. Tesla who could indeed work throughout the night, would often crash for the entire day of sleep after his exploits. He exhibited classic signs of manic creativity, which might have been interrupted by short recuperative naps or long recovery sleep. Otherwise, Tesla was nothing more than a short sleeper." Also this blog post does not give a proper source: However, Edison's assistant is said to have hinted that Edison in fact slept more than he admitted. And "he often got in a couple of 3 hour naps during the day" - which is much more than the poster in the question states. Leonardo's polyphasic sleep is probably an urban myth. I could not locate any credible sources with any notes on his sleep habits, and yet da Vinci is nearly always mentioned whenever the art of napping comes into question. It seems quite strange that someone would come up with a crazy polyphasic schedule idea at the time of leisurely Renaissance life that was well-timed by the superiority of sunlight over candlelight. Allegedly, hinting at a monophasic mindset, he spoke of death: "As a well-spent day brings happy sleep, so a life well used brings happy death". Even more telling is Bandello's report on da Vinci's work over "The Last Supper". Leonardo would work continuously from dawn to dusk forgetting about food and drink. Stunned Bandello would definitely reported the round-the-clock work of a polyphasic sleeper as even more amazing. "There are some people who need very little [sleep], and there are some people that need more than the average," explains Dr. Vicky Seelall, the director of the Sleep Health Center at Beth Israel Medical Center. "Five percent of the population goes down to four hours a night or even less at times," says Seelall, "and there's about 5% that will need somewhere between 10 and 12 hours of sleep a night. "I have one patient that only sleeps two hours a night, and he's completely fine." Not the answer you're looking for? Browse other questions tagged neurology sleep nikola-tesla . Did Isaac Newton give lectures to empty rooms while he was a professor at Cambridge? Do 7 to 12 year olds need 10 to 11 hours of sleep per day?